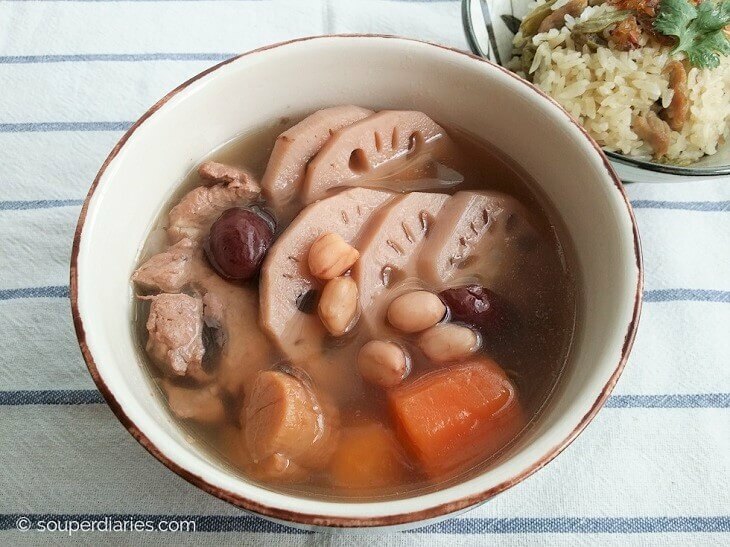 The combination of lotus root with pork ribs and peanuts is a classic Chinese soup. In Cantonese, we call lotus root soup ling ngau tong (莲藕汤). Lotus root signifies abundance and prosperity to the Chinese so this is a popular soup for many who celebrate Chinese New Year. This soup brings back bittersweet memories for me as it was the last soup that I cooked for my late mother before she passed on a week later. I was really glad when she said that she liked it. In addition to the lotus roots and pork ribs, I added dried scallops, dried red dates and dried squid. 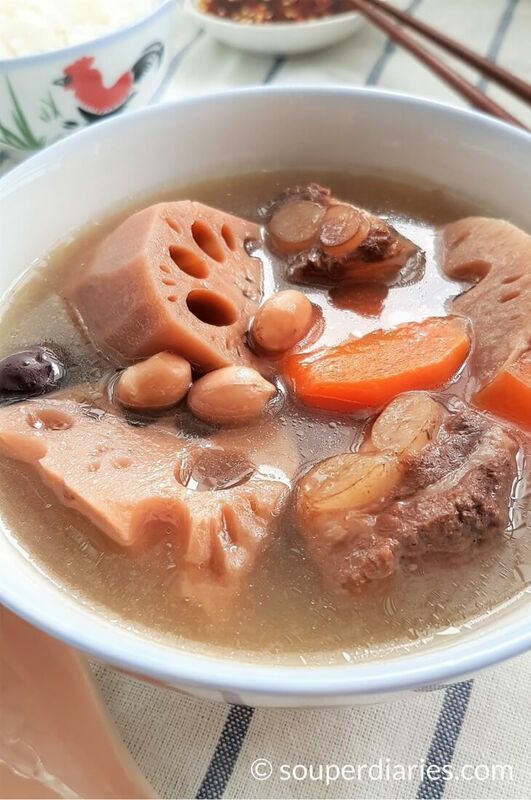 The pork ribs, dried scallops and dried red dates impart sweetness to the soup while the dried squid gives it an umami lift. Sometimes if I happen to see arrowroots (not to be confused with arrowhead) when grocery shopping, I would get some and add them to this soup. Arrowroot is a tough tuber root and takes a bit of work to skin it but once cooked, it turns soft and sweetens the soup. But for this recipe, I will be using the basic ingredients which work great. I used my Happycall Alumite Ceramic Pot to boil this soup but any soup pot will do too. This pot is one of my favourite kitchen helpers. Read about it in my review. 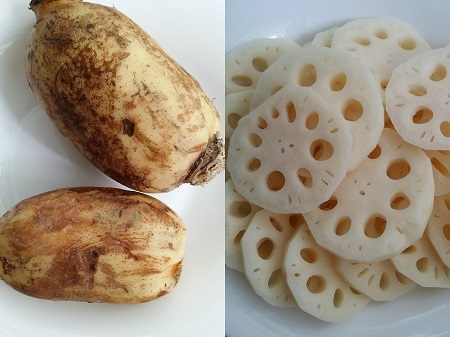 The picture below shows the lotus root before cutting and after cutting. It is not the best specimen but it was what I could find from my local supermarket at that time. Visually, they look more appealing once you’ve peeled and cut them. Don’t they look like cute little wheels with all those holes? Try to look for heavy and firm ones with no soft spots. This vegetable grows deep in the soil of pond and river bottoms so sometimes they are still covered in mud when buying them from the market. Wash them to get rid of dirt or mud (if you’re buying the fresh ones) before peeling and cutting. Nutrition wise, lotus root is rich in dietary fiber, vitamin C, copper, iron, potassium, thiamin, manganese and is very low in saturated fat. On its own, it has a mild taste and a soft crunchy texture. Once cooked, they will absorb whatever flavors that are in your soups and dishes. Almost every part of this plant can be used for cooking. The root (stir-fried, steamed, boiled, braised, made into candied lotus root), leaves (for wrapping food especially Chinese zongzi) and the petals are sometimes used as garnish. Lotus seeds can be eaten raw and can also be boiled with other ingredients to make tong sui (dessert soups). The seeds can also be grounded into a paste which is a popular and common ingredient in mooncakes and daifuku (Japanese round mochi). 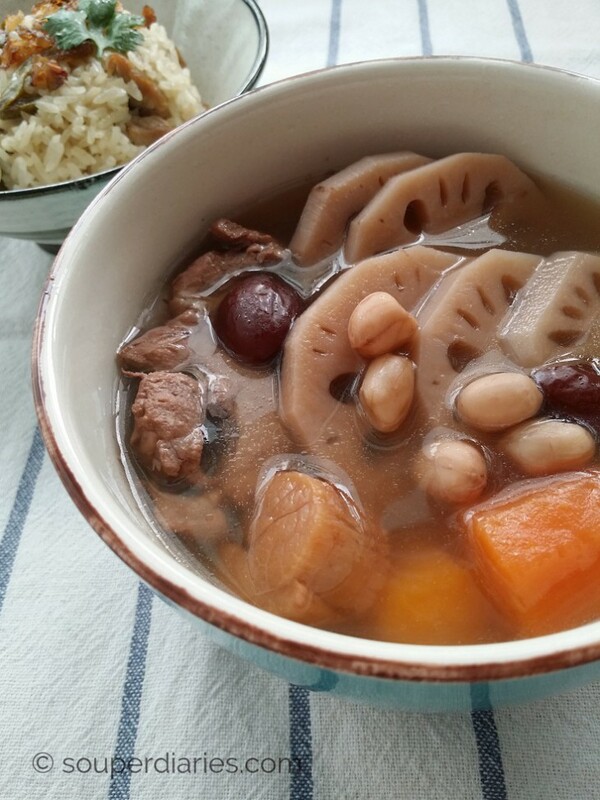 Peanuts and lotus root pair well together for this soup. Like lemon and cheese. Or bacon and eggs. Fish and chips. You get the idea. You can de-shell the peanuts before cooking for a clearer soup but you can skip this step if you don’t have the time. Personally, I won’t be bothered to as it does not make a difference to how the soup tastes. If you don’t care for peanuts or you’re allergic to them you may replace them with arrowroot as mentioned above or simply omit it altogether. To soften peanuts like the ones shown below, soak them in hot boiling water for about 30 minutes before you cook them. I’ve found that this method always work for me. Otherwise, the peanuts may still be slightly crunchy after cooking. When boiling soups, I use fatter and rounder peanuts but I prefer smaller peanuts in stir-fried dishes and nasi lemak (a fragrant rice dish cooked in coconut milk and pandan leaf). If you enjoy eating peanuts, you may also wish to read about this soup. Did I mention before that I absolutely adore peanut butter? I just love them so much. Chunky, creamy or with fruit spreads, they’re all yum! I could eat stacks of bread with it. And have you ever tried Reese’s peanut butter cups? They satisfy my sweet tooth cravings everytime. A one-dish meal soup that is flavorful, rich and nutritious. 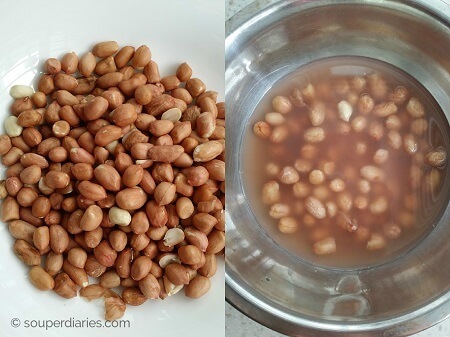 Soak peanuts in hot boiling water for about 30 minutes. Discard the soaking water. Blanch pork ribs in a small pot of boiling water for about 5 minutes to remove impurities. While waiting for the pork ribs to be ready, wash, peel and cut the lotus roots into 1 cm slices or irregular bite sized pieces . Remove pork ribs from pot and set aside. Put in all the ingredients in a soup pot. Add in enough water to submerge all ingredients by about 1 to 2 inches. Bring to a boil and then let it simmer on the lowest heat for about 2-3 hours until the meat is very tender. Season with salt and serve hot. I’m sorry to hear about your mom. Hopefully this soup will bring back fond memories for you. I find it so amazing how certain foods and smells can make us think of people! I’ve heard about Lotus before but never eaten it. This sounds like a great soup to try, it is certainly different! Wow! This blog is awesome! I love soups and this is a recipe that I would love to try. However, it takes quite some time to wait it to cook. Do you have any ideas on how to make the process a little bit faster? Thanks for writing in. I love soups too and the slow simmering draws out all the flavors of the ingredients. If you want to make the cooking process faster, a pressure cooker is great as everything can be cooked much faster. This Instant Pot has 8,000 over awesome reviews in Amazon. This is a very nutritious soup. We have this soup at least once a week. The recipe is about the same except I don’t use the dried cuttlefish as it tends to make the soup very fishy. This really sounds great. However, I am not much of a soup person. I am the type of person that will pour of the soupy part of the soup and just eat the solids. Is the Lotus Root used in other types of non-soup recipes? Welcome to Souper Diaries! I eat and drink everything in the soup. Haha! The soup is really nutritious and tasty as the flavors and nutrients from the ingredients would be released into the soup. Yes, lotus root is also used in other types of dishes besides soup. They are used in stir-fries, salads, braised dishes, made into candied lotus root, deep fried as chips, etc. Oh my goodness, this looks unbelievably tasty ! I love the sound of lotus root, I’ve never heard of it before, but I really love foods that soak in other flavours. This sounds like a fantastic recipe, if I can source some lotus root, I’ll definitely try it. Hi Skai, you can get lotus root from Asian markets. The fresh ones are covered in mud and you can request for it to be removed. another great soup! And I just love how the lotus root looks cut up. Wow so pretty. Your soups are so original if I use the North American standards but seem to be so traditional in Asia. And that is awesome that you are bringing us traditional home recipes. But you mention a combination that I am not familiar with. Lemon and cheese? It might just be me but I have never heard of this combo! Is it common where you live? Oh I can see that! I am familiar with the apple and cheese combo, which is awesome in desserts. I can somewhat picture cheeses and lemon but I am still having a hard time imagining how the combo pairs up. I will have to give it a try! I usually find them in a cake shop and they’re very delicious. The tartness of lemons pairs wonderfully with cheese. Just perfect! Wow, your recipe for lotus root soup looks absolutely delicious! I will have to make this recipe at home. I love the pictures that you provided with the post – very informative to the recipe! 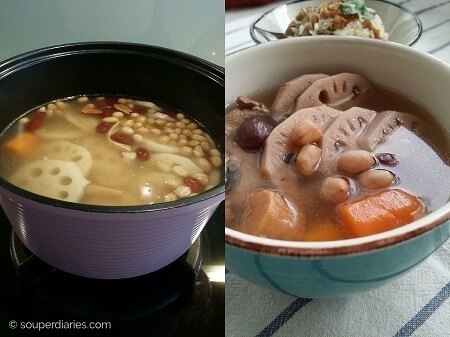 In general, I love lotus root in soups, so your recipe will come handy! Thank you, for sharing! Wow, this is a really interesting recipe! I had honestly never even seen a lotus root before but it looks like there are some really interesting flavor combinations here. Thank you for enlightening me with your recipes. This soup sounds delicious. The Lotus Root soup sounds so intriguing and the photo looks great. Lotus Root looks so appealing when cut! I didn’t know much about Lotus Root and I learned a great deal from your information. Lotus Root has so much fiber and nutrition! It’s good to know that you can use all parts of Lotus Root. I like that fact since I don’t like waste in general. Thanks for sharing this soup. Thanks for your comments, Dinh. I hope you’ll try out this soup! Thanks for your insight, information and for creating this lovely website!